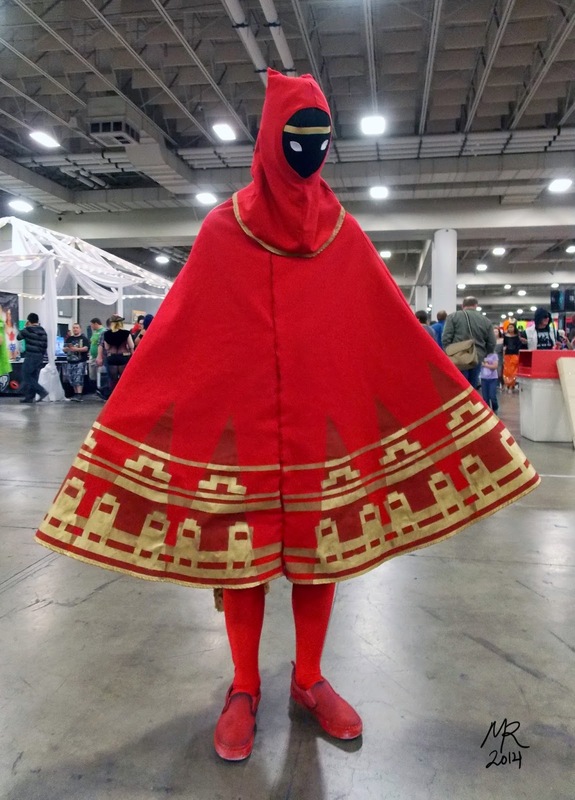 For starters here is Kanmon Servoss as the Traveler from the incredible video game Journey. If you have not played this game DO play it. It is really beautiful and has some great storytelling. Kanmon made this cosplay himself. His mask has lights in it so the eyes light up. The gold symbols are actually spray paint and his scarf, not shown, has reflective tape so the fabric shines when you take pictures or stand in the light right. As I wandered about the convention I managed to spot this guy from pretty far back. Rauben "Rib" Creed was walking around in his cardboard AT-ST, or chicken walker from Star Wars. For something made out of cardboard this thing was really well made. I always love finding well made costumes made from the oddest of materials. Rib is from Canada and had moved to Utah a while ago. He grew up watching his mother create costumes and he has always loved creating things. 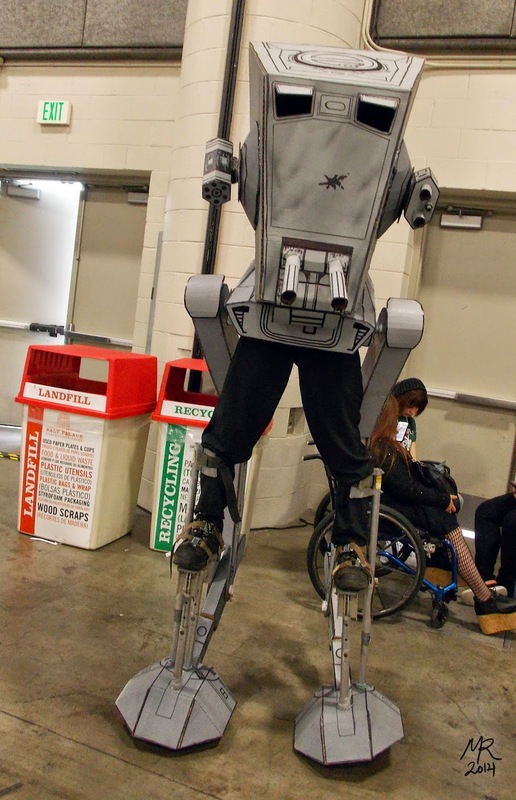 The AT-ST took about two months of work to create. Also, he can shoot glow sticks out of it. Fun Fact: Rib won second place Beginners in the cosplay contest. 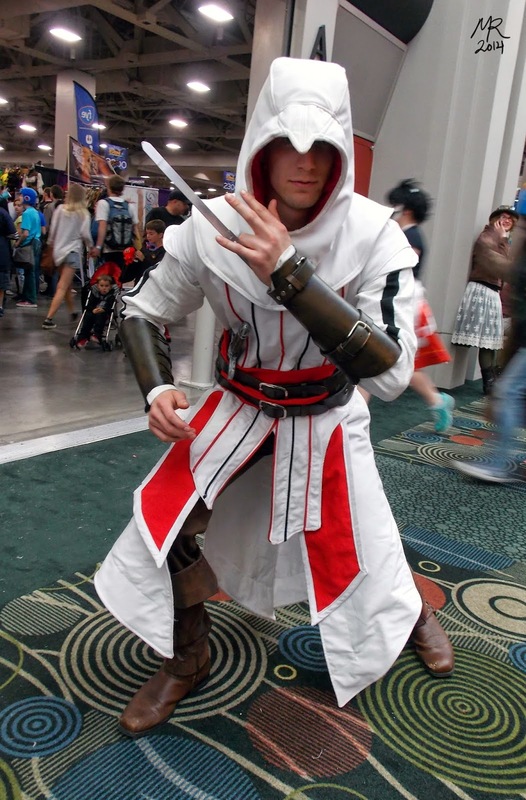 Brett Mitchell made this assassin from the Assassin's Creed games. His costume has details and effects from all over the different games. He did his own leather work and made everything except for the shoes. The hood stays stiff around his head to follow the game physics of the first game. He calls himself a Master Assassin. I am a huge fan of the Legend of Zelda series and the game Majora's Mask is at the top my favorites list! So when I ran into this group I was pretty excited. 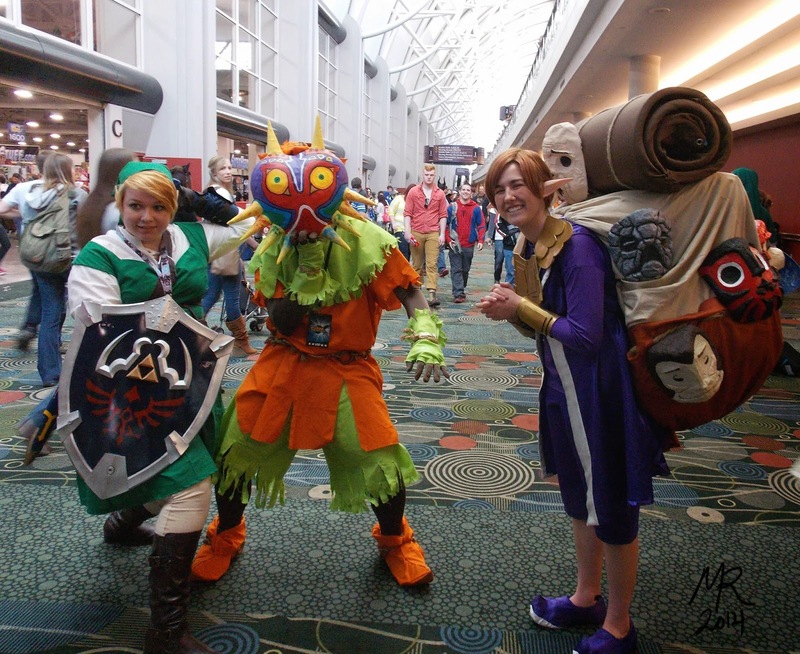 We have Kimberly as Link, Haydn as Skull Kid, and Bailey as the ever smiling Mask Salesman. Bailey said that when she smiles her eyes shut just like the salesman, plus she loves the character, so cosplaying him made sense. All the masks on her back are made out of milk jugs! They are covered in her own recipe for paper clay and hand painted. The Majora Mask on Skull Kid is a wire mesh mask covered in paper-mache and and air dry clay. All the costumes were made by their wearers and are probably one of my favorites to have run into at the con! I love all their expressions in this shot... yes, even Skull Kid's! This next one really blew me away as I was leaving the convention on the second day. Fantasic work and really detailed pieces! And to top it all off, he is king Somber from My Little Pony! Brad Broadhead took six months to build and sew this amazing cosplay. One month of that was for the sword alone, which pulsates with purple light! 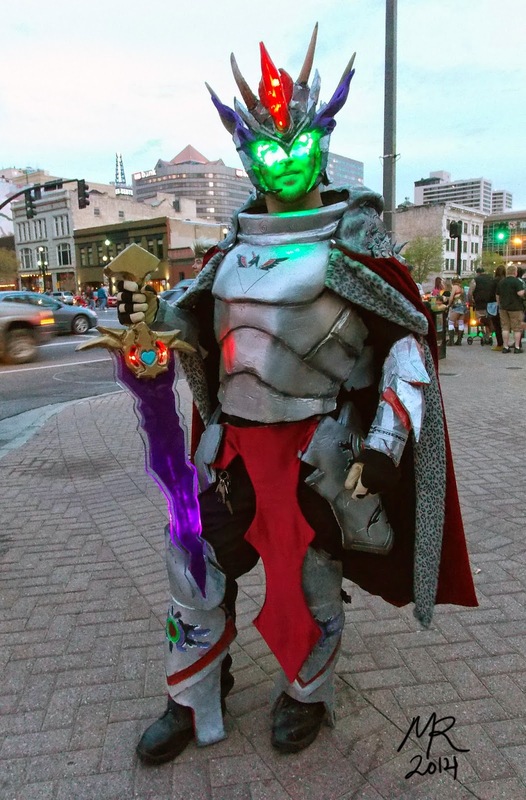 He used Pepakura and 3d models from the video game Skyrim to create his helm and armor. I always love seeing a recognizable character made into something new. 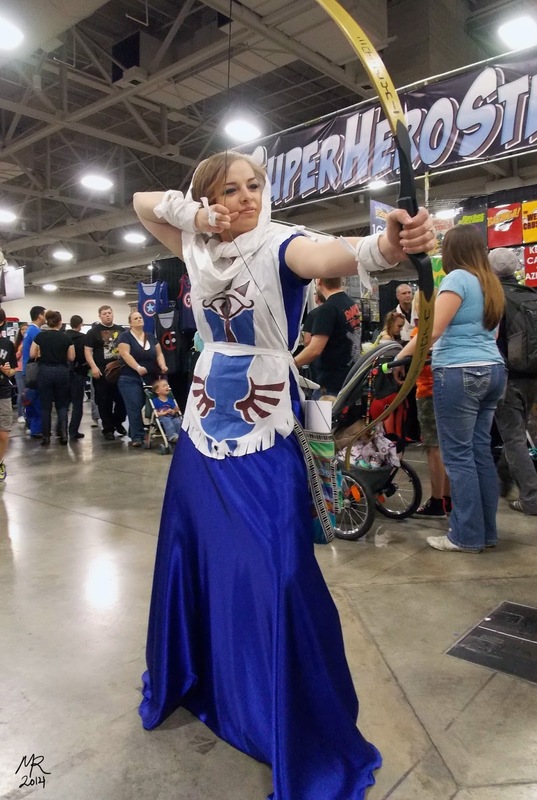 Angie Neio pulled out her old prom dress, decked out a wicked sweet bow, and tore up some white fabric to create Sheik from The Legend of Zelda: Ocarina of Time. She hand painted the design on the fabric and the symbols on her bow as well. It is a really beautiful cosplay and I love how unique it is. Can you believe that tabard is hand painted! Wow! This Wheatley and Chell were a fun find! 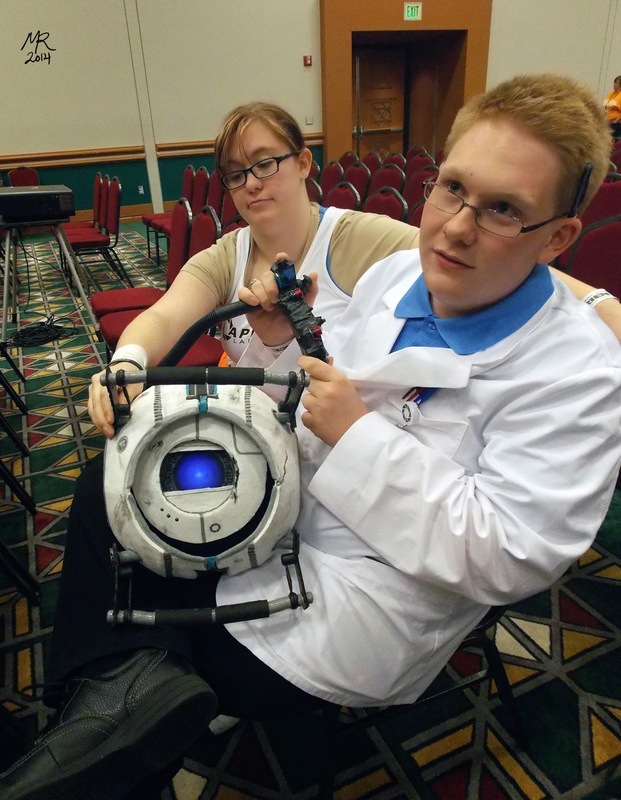 Luke Albertson and Alisha Campbell made these cosplays from the awesome video game, Portal 2. The robotic Wheatley is made out of Styrofoam, paper-mache, and has an arduino, lights, and servos. The little guy talks and gets all shifty eyed and everything! Kudos to the fantastic paint job done by their neighbor Hydee Yearling. Alisha as Chell and Luke as Wheatley, Portal 2. That is it for now. Stay tuned though, next week I will posting the results of my Super Smash Scavenger Hunt! I am actually surprised at the characters we found. See you all next week. Awesome costumes! So wonderful to see all of the creativity! Thanks for the interview btw. FYI, her name is spelt Alisha, and she played Chell, not Shell. Check out more details about Wheatley here: animatronicwheatley.blogspot.com. Thanks again! Thank you! I fixed the spelling errors and feel bashful over it. I totally knew how to spell Chell and then I didn't, haha! Last time I update late at night. Thank you again!